I promise I didn’t just type random words in the title. Really. Jessica, Namine, and I joined my parents and sister over at my brother’s house for a Gilmore Girls night. (Don’t give me that look. You probably watched it, too.) Namine had little interest in that, though, so she worked on some schoolwork while we were there. To that end, my brother’s wife brought out this cute little desk for Namine to use. It was perfect for her, especially for schoolwork with its compartments on the sides. It was so perfect that when we left that evening, my brother and his wife told us we could take it home. So today, while Namine was doing her schoolwork, she took it for a day-long test drive. She loved it. When Namine’s therapist works with her on handwriting, she often has her writing vertically, as one would on a chalkboard. 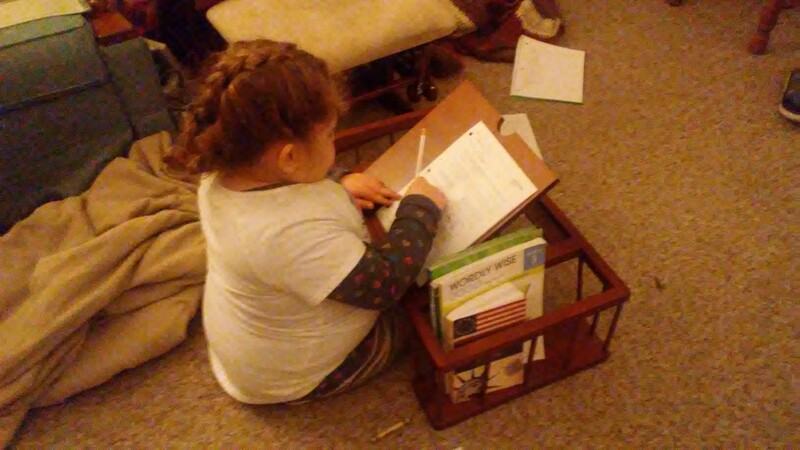 Namine’s new desk can prop up in the same manner, which made it perfect for doing her handwriting homework. She was quite comfortable with the desk surface propped up, and continued with her math homework that way as well.